THE WRITING BUDDHA - Opinions | Books | Movies: It's All in the Planets by Preeti Shenoy (Book Review- 4*/5) !!! 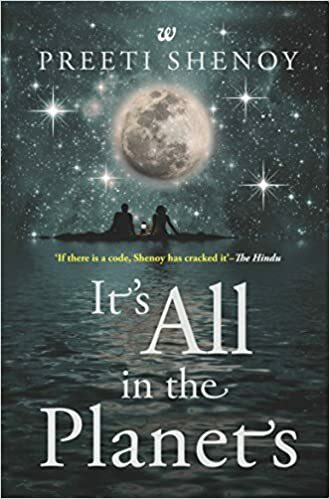 It's All in the Planets by Preeti Shenoy (Book Review- 4*/5) !!! Preeti Shenoy is one of my favorite authors and I make sure that I have her book with me on the first day of its release itself; though I missed her last book which was her first attempt at non-fiction but I am sure that I'll read it soon enough. I am just done reading her latest release named "It's All in the Planets". By the cover page and the title of the book, I had wrongly assumed that it's another non-fiction by her but after I read the synopsis did I realize that yes, Ms. Shenoy is back with her forte- FICTION. The book is indeed a treat for her fans as it speaks of love, relationships, human emotions and several circumstances a human being goes through in this thing called LIFE. Through this book, she is also wanting us to believe in DESTINY and that everything is not in our hands. We should leave somethings to happen according to its own course. The book is written in a very simple language. Yet again, Preeti have tried writing as first person for two different protagonists in alternate chapters which makes it more interesting reading the same story from two different perspectives. Though I felt that many scenes are repeated as both the characters narrate the same part in first 1-2 paragraphs. What I liked about this book is the way author have treated the same plot which every Indian romance-genre authors write in a very special manner making it look like something mature. If only every writer had this talent. The characters are very well described by the author and you can relate with each one of them. The character of Nidhi is so simple yet charming that you want to meet her. Aniket's desperation to impress his girlfriend so that she doesn't leave him is also handled well in first half. The relationship between Nidhi and her step-mom, Tara, is very well portrayed. The way how Aniket's orthodox father changes his mindset in the ending also looks genuine. The good thing about the book is that it breaks so many stereotypes in such a simple manner that never sounds preachy or forcible. Talking about the drawbacks, I didn't find story much based on the theme and title of the novel that all is in the planets. Initially, the horoscope that is shared before each chapter is written in the same language as they are printed in papers and magazines but in the second half, it is written in such a manner that it sounds fake because of it's direct reference to the character's circumstance. The climax isn't very movable though it does everything you wanted to happen in the end but still, it felt incomplete. But still, this book is a light read and makes you think in many scenes. I give this book 4 stars out of 5.